Time for one of those excruciating self-congratulatory pat on the back type blog posts. Half a Million page views. It’s getting hard to close the door on my gear cupboard these days so it’s time to say goodbye to a few bits of kit I no longer use / want. You can contact me either via the comments below or email me direct on backpackingbongos@gmail.com. Mountain Laurel Designs Trailstar + Oookworks oookstar + asTucus cuben door – £300 for the lot + postage at cost or collection from Nottingham. Now sold. 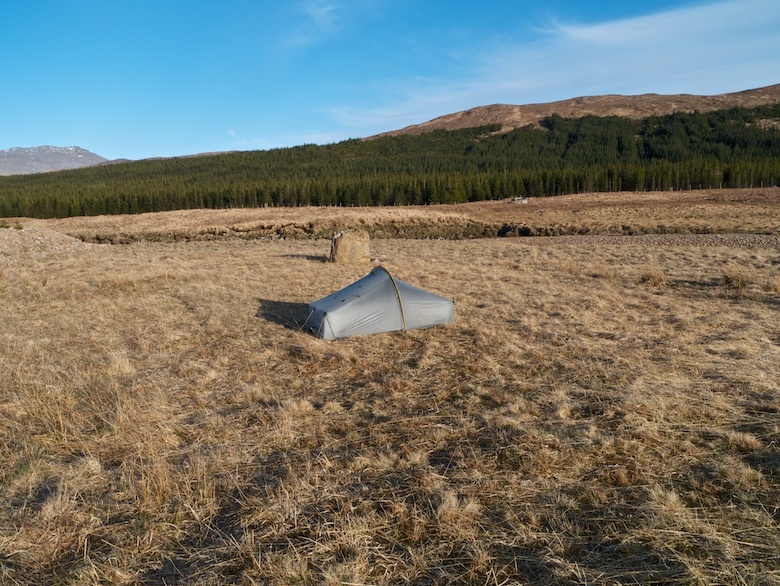 This is a great shelter, totally bombproof and highly regarded. Why are you selling I hear you ask? I really want to like using the Trailstar but have realised that at heart I am a tent person. 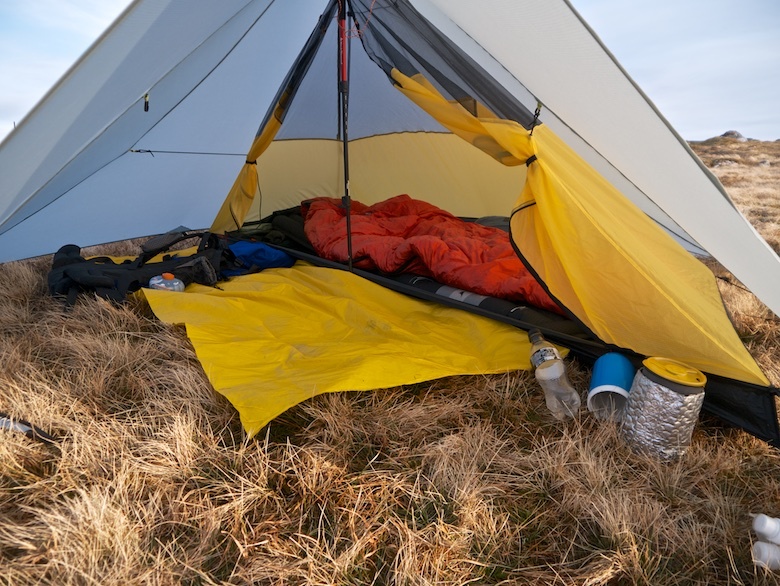 The Trailstar itself is well used but in good condition with no nicks, tears etc. The seams have been sealed with Silnet (on the outside) and it has the necessary guys all cut to length and attached. The Oookstar is as good as new and is rarer than hens teeth these days. I had it made with a lightweight Chikara floor and half mesh / half solid walls. The Cuben door is brand new. Obviously you will need your own trekking poles and a set of decent pegs for this. I would prefer to sell this lot together. However if someone offers to take the Trailstar itself off my hands first I would be happy to split the items (I have had offers for just the Oookstar but don’t want to be left with just the Trailstar). Separately I am looking for £120 for the Trailstar and £170 for the oookstar. The brand new door I will let go for £40. I’ll be sorry to see it go. 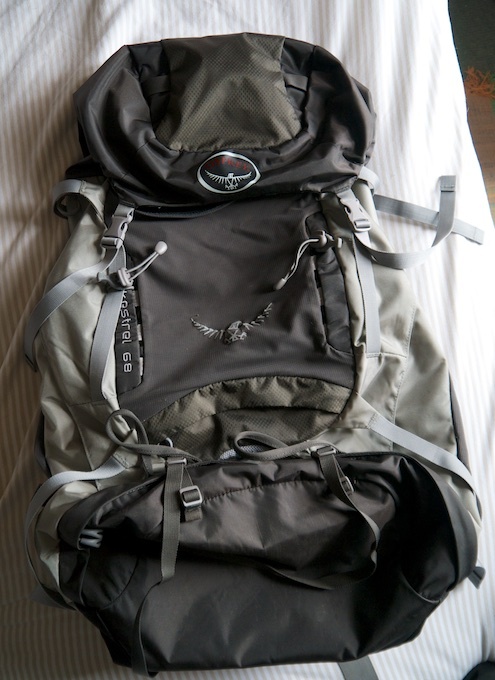 Osprey Kestrel 68 Rucksack – £60 + postage at cost or collection from Nottingham. I purchased this last year to take to Sarek but it was not big enough and I never really got on with it. It has only been used for three backpacks so it is in pretty good nick. Adjustable back. 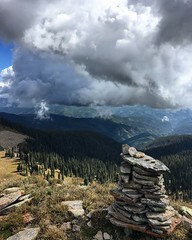 The raincover is missing as it took off and is on a mountain somewhere. 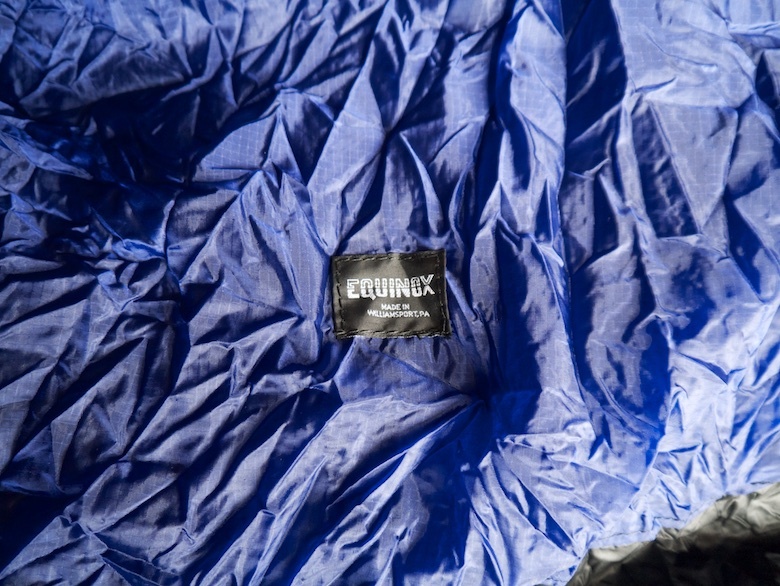 Equinox ultralight mummy bivy – £40 + postage at cost or collection from Nottingham. Now sold. This featherweight bit of kit has a silnylon base and breathable nylon upper. It is not waterproof but designed to be used under a tarp. 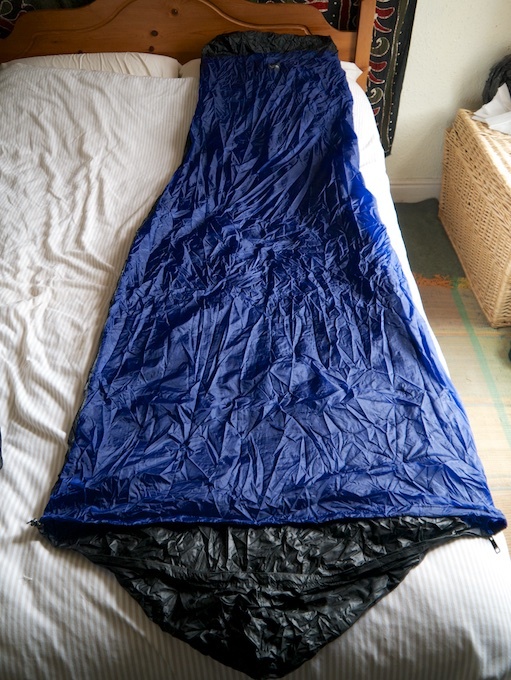 Think of it as a sleeping bag cover rather than full bivy bag. North Face Apex Elixir Jacket (medium) – £30 + postage at cost or collection from Nottingham. I wore this once and then decided that I don’t like softshells. Therefore in perfect condition. Model not included. 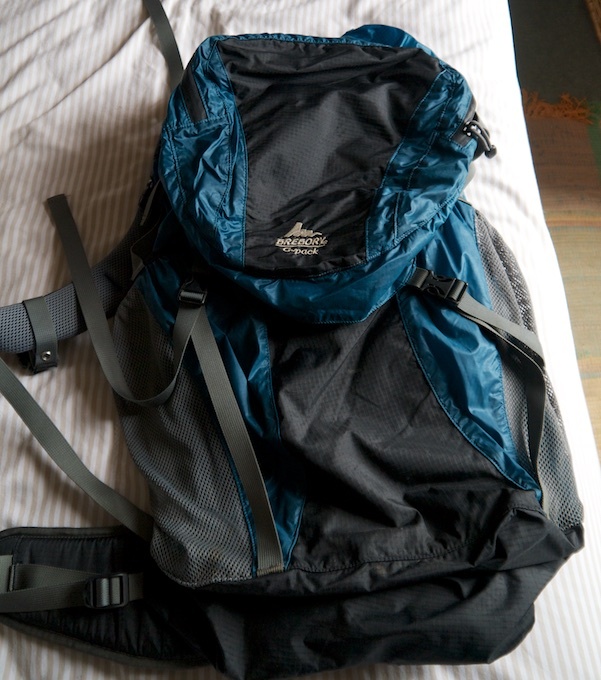 Gregory G Pack rucksack size medium – £25 + postage at cost or collection from Nottingham. 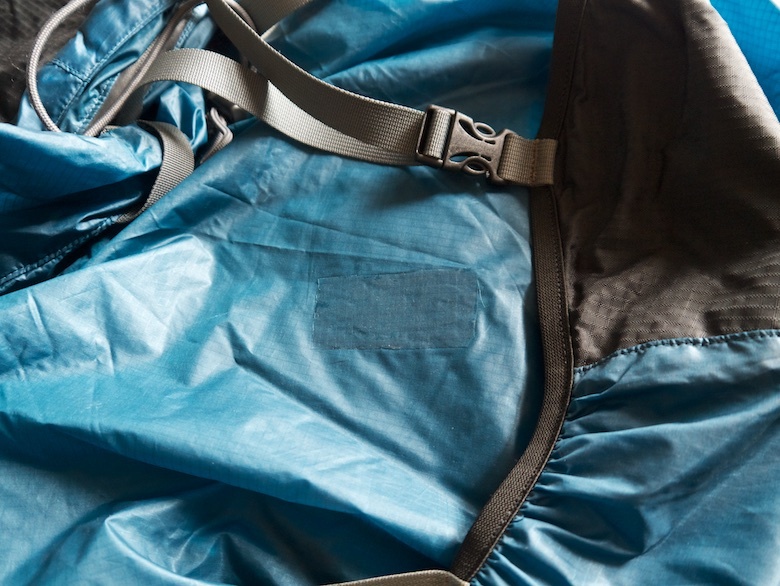 This pack has a sturdy back panel with the main body of the pack being made from silnylon. It is therefore relatively light. 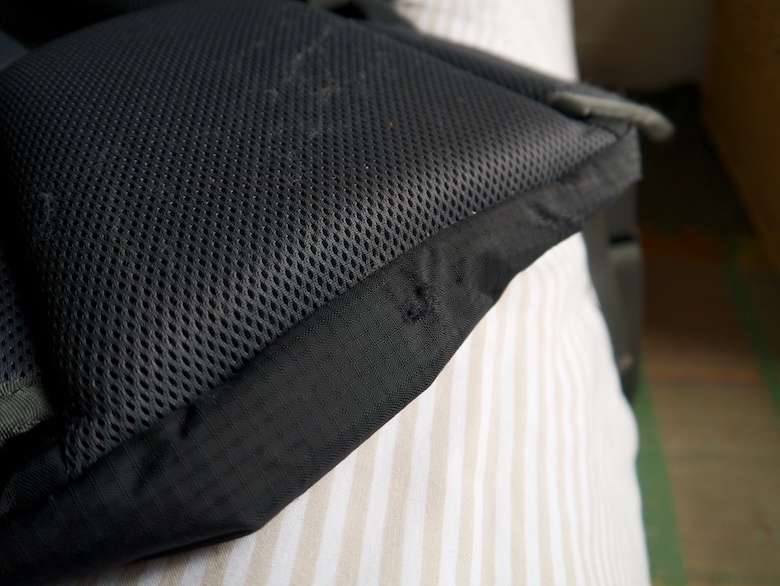 There is a small patch on the silnylon (photo below) and a small part of the base is worn (also photo below). 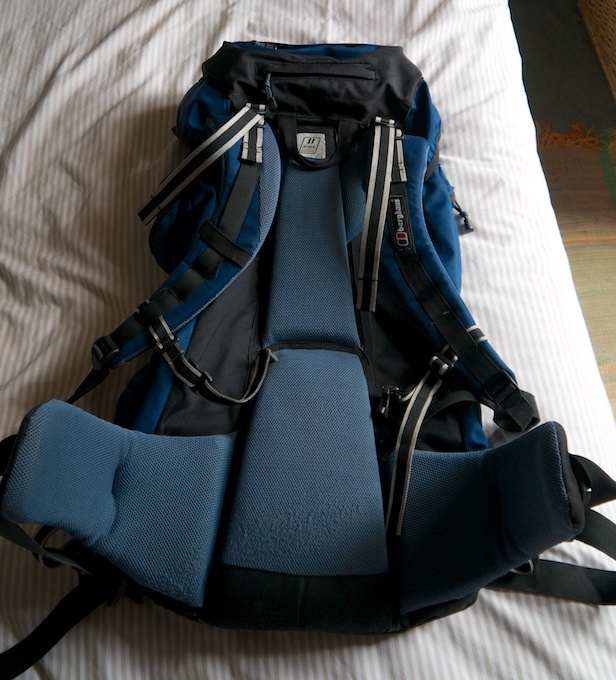 A bargain if you want to buy your first lightweight backpacking sack. 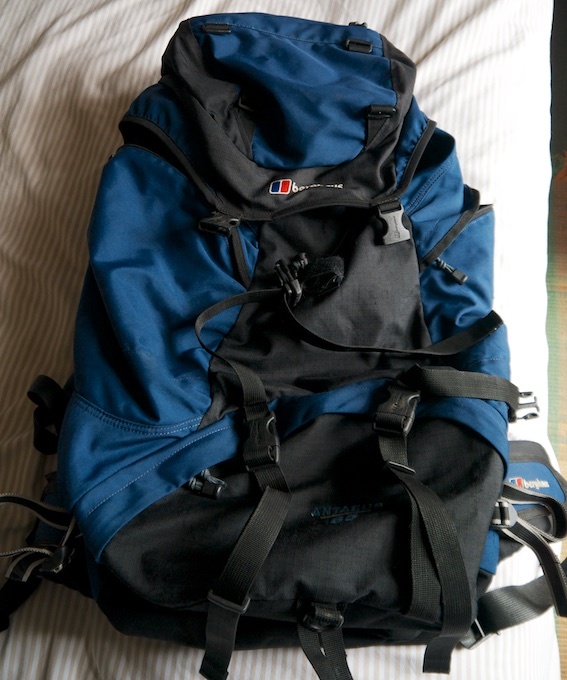 Berghaus Antaeus 65L rucksack – £20 + postage at cost or collection from Nottingham. 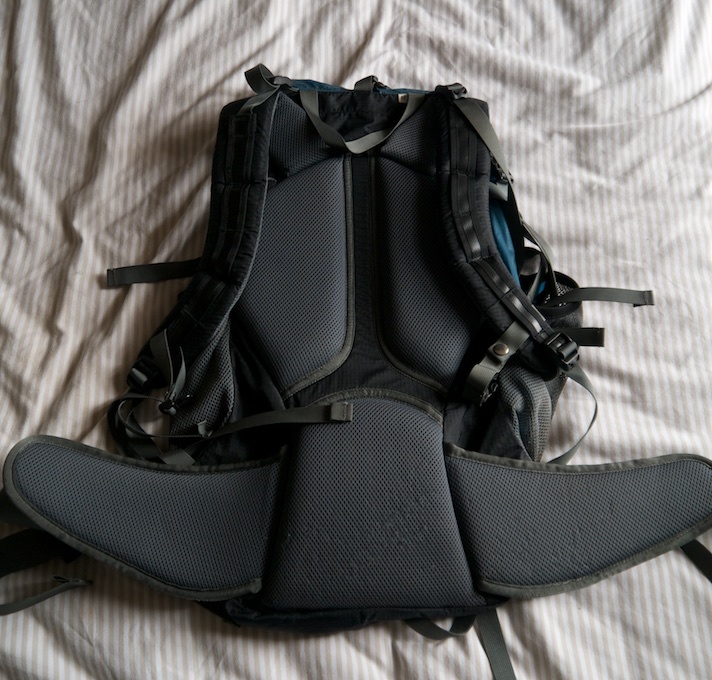 An old fashioned bombproof rucksack that comes in at around the 2kg mark. Good for DofE or someone starting out backpacking. I initially felt pretty smug sitting alone in the first class train carriage. It had only cost a few quid more than standard and I was enjoying the extra space along with the complimentary food and drink. I made sure that I got my money’s worth. The smile however was wiped off my face just outside Penrith when there was a points failure. We sat without moving for over an hour and I became anxious that I would miss my connection at Glasgow for the Oban train. The hour and a half I had given myself in Glasgow shrank to twenty minutes and it was a frantic dash between the two stations. It was a tight squeeze on the Oban train and it was difficult to avoid playing footsie with the young woman sitting across the table from me. There were a few Challengers in the carriage and the journey passed quickly with chat whilst enjoying the scenery as the train slowly chugged its way towards the west coast. I had picked a hotel pretty much next door to the signing out point at the Oban Youth Hostel, a fair distance from the train station. 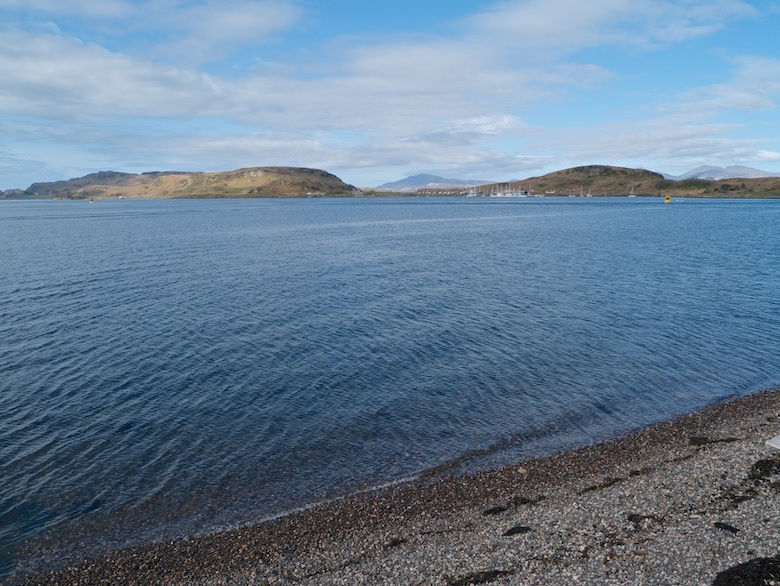 As is usual in the Highlands my room was overpriced for what I got (I was in the Oban Best Western) and I slept badly to a cacophony of slamming doors and the sound of snoring from next door. I had the usual pre Challenge nerves mixed with excitement. I couldn’t wait to set off the following morning and head towards the east coast. It was nearly 10am by the time I signed out, well behind the main pack of Oban starters, most of whom appeared to sign out bang on 9am. This mean that I spent much of the day walking on my own. One thing that always surprises me is just how early other Challengers manage to be hiking by. I do like a lie-in in the morning and throughout the whole Challenge I was rarely walking before 9.30am. I quickly dipped a toe in the water opposite the Youth Hostel and set off along the road. 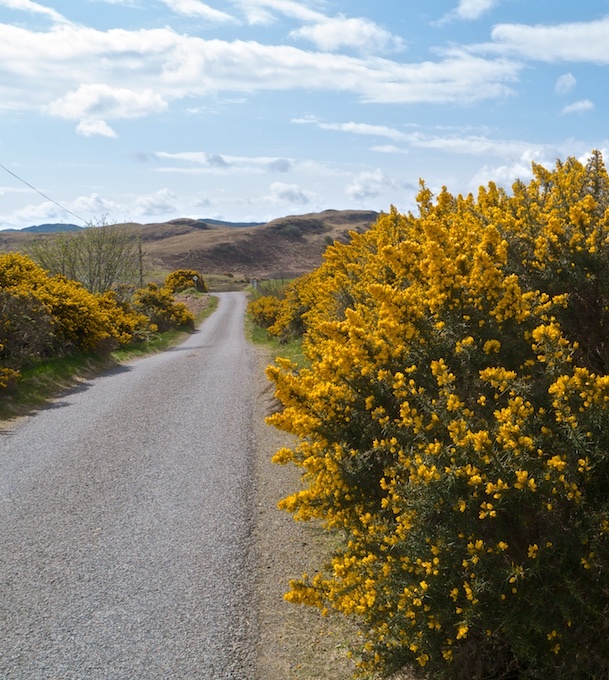 A significant part of the day was spent walking through Glen Lonan along a minor road. Road walking is something that I usually try to avoid at all costs. However the road was quiet and the scenery pleasant. Best of all it headed in an easterly direction and the climbing was minimal. 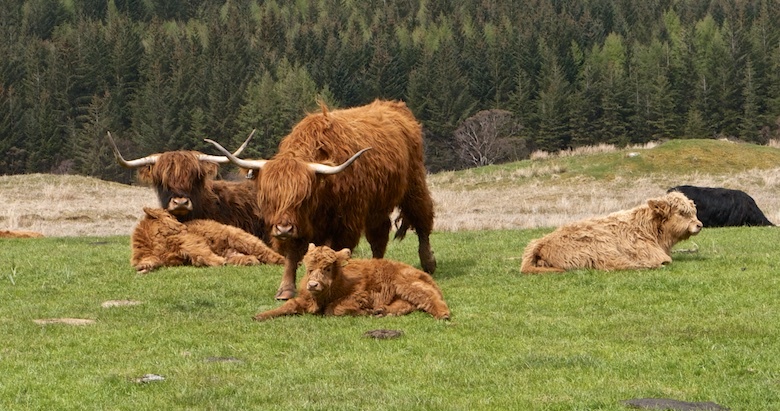 Gorse perfumed the verges and Highland coo’s grazed the fields. I caught up with a couple of Challengers I had chatted with the evening before, eating lunch with them on a bridge. Otherwise it was a solo yomp. 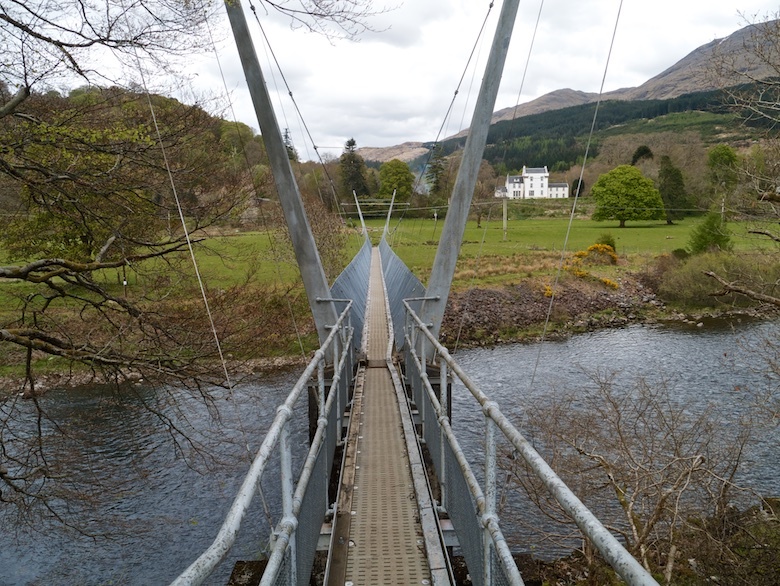 The cafe in Taynuilt provided a second lunch before I set off to find the track to the swing bridge across the River Awe. This is a great structure, providing a bit of bounce as you walk across the middle section. 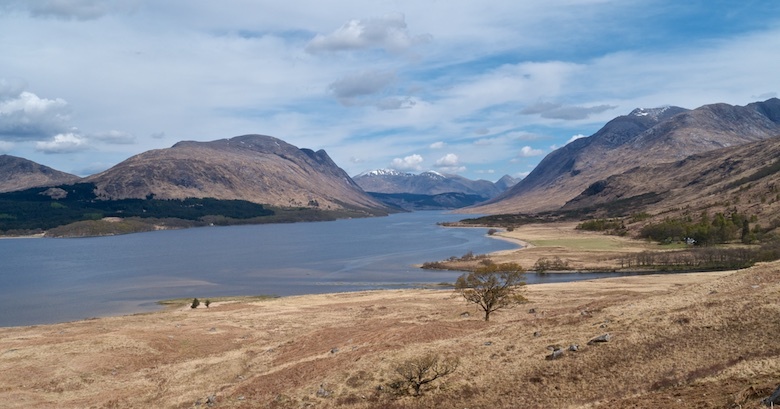 I have to admit that I was tiring as I started along the track on the east side of Loch Etive. My pack was heavy with five days food and enough fuel to last me for two weeks. With very little fitness training before setting off my body was complaining. 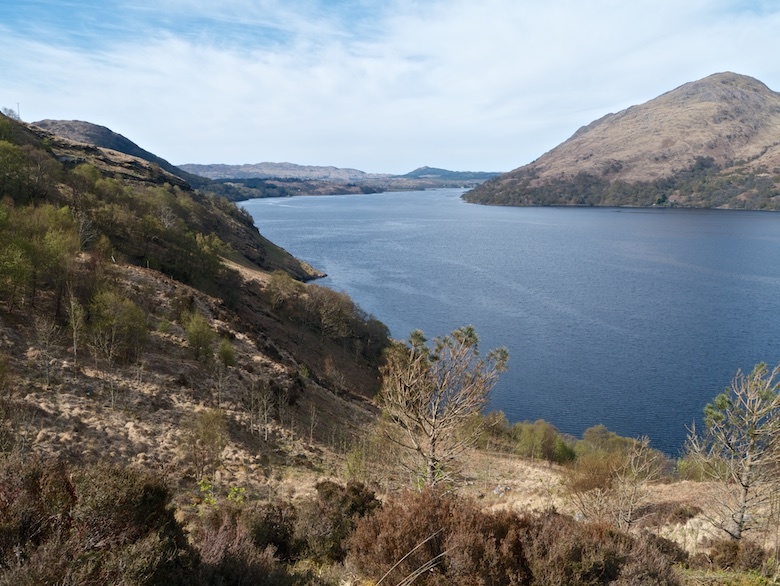 However the scenery more than compensated, the eye being drawn down the loch to the mountains in the distance. The spot that I had chosen to camp was already occupied by several tents, one of the disadvantages of being a late starter. Instead I carried on for a mile or so and climbed up onto a wooded hill as recommended by Robin from Blogpackinglight. It turned out to be a superb spot, flat, dry and sheltered. I avoided camping close to any trees that looked like they were close to retirement, tough as they all looked ancient and were covered in moss and lichen. I finally felt that I could relax, the travelling and first day were behind me. It was now simply a case of putting one foot in front of the other for thirteen more days without falling over. Something visited my tent at some point near dawn, there was the sound of snuffling coming from the side that my food was stored. I shouted ‘go away’ and whatever it was did. 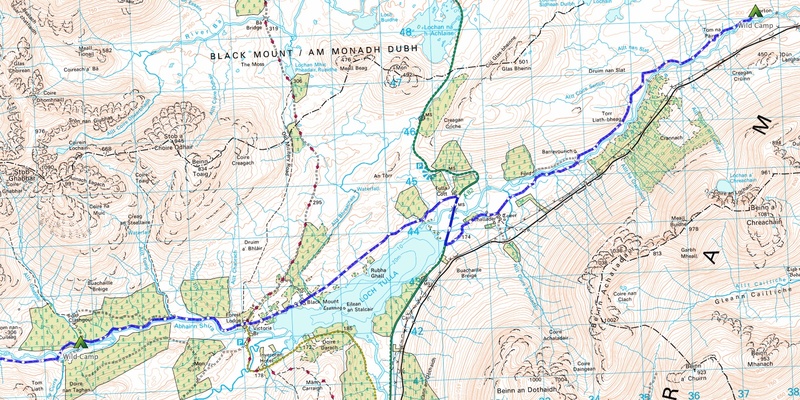 My original route plan was to climb a couple of Munros to the south of Glen Kinglass. However it was evident that the ridges were still covered by snow. I did not fancy tackling them in trailshoes and without ice axe and crampons. My low-level alternative was just as attractive in the warm sunshine anyway. It would also give me the opportunity to build up some fitness (and lighten my pack by eating some of the food). 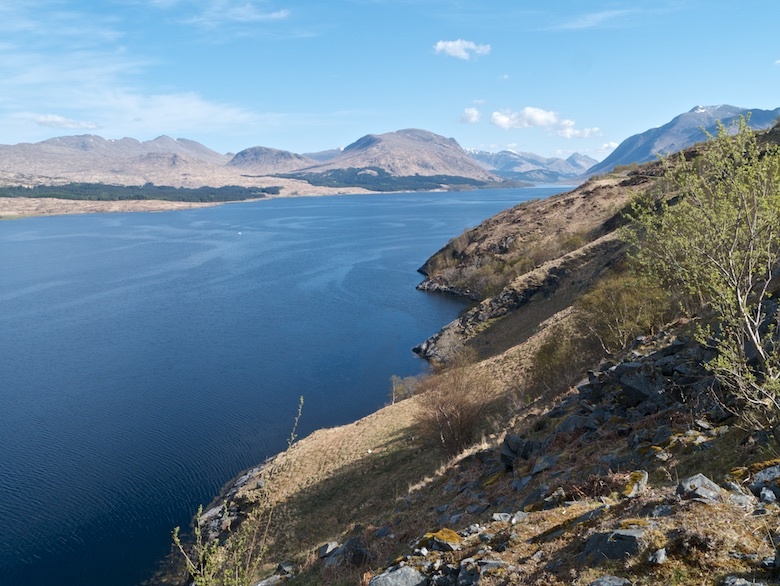 Loch Etive was splendid and I took my time on the roller coaster of a track as it rose and fell and twisted along the loch shore. I’m going to have to return for a hill bagging expedition of the pointy peaks on either side. Glen Kinglass was also beautiful but it went on and on and on. Walking for hours it felt like I was not getting any closer to the lodge. 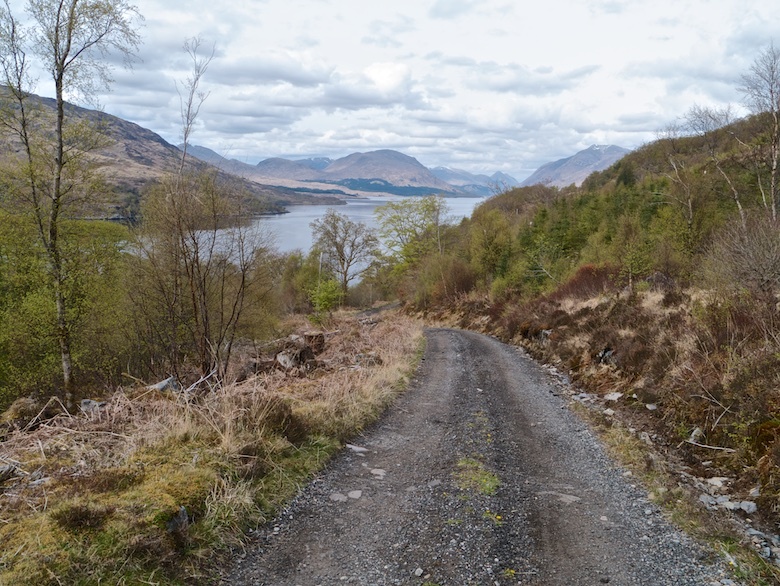 The feeling of remoteness was rather spoilt by the solid track and the wooden electricity pylons marching their way up the glen. The warmth along with the hard surface soon led to hot spots on my feet, despite wearing trailshoes. Finally the lodge was passed and the track started to climb towards the watershed. 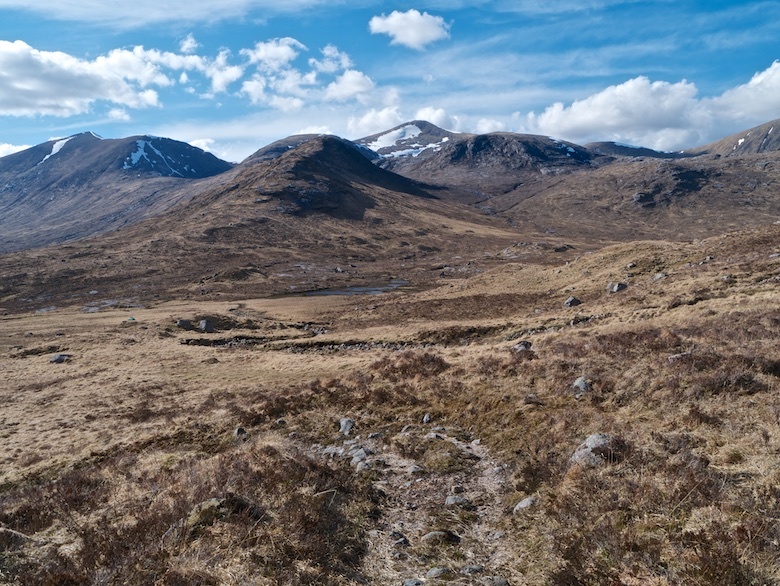 The views over the Black Mount hills were spectacular as the path gained height. 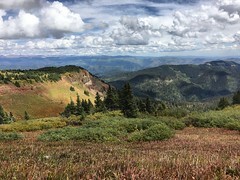 Patches of snow on the higher slopes shone bright under the blue sky. 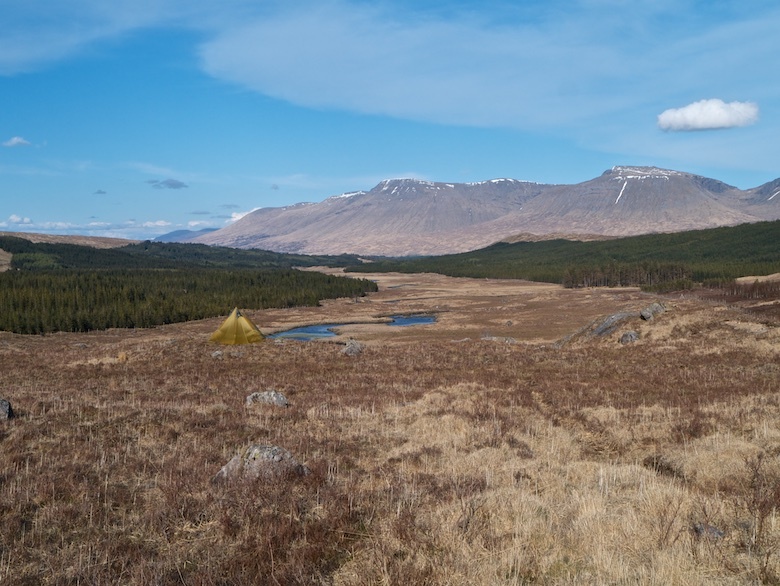 I had planned to camp next to Loch Dochard but everywhere I looked was either tussocks or bog. However it was good to sit for a while by the still waters and gaze out over the mountains. I soon passed a Golite SL3 pitched in a spectacular spot on a bluff looking out over the glen. However it was being buffeted by a strong wind and I was aware that the weather was due to change for the worse during the night. 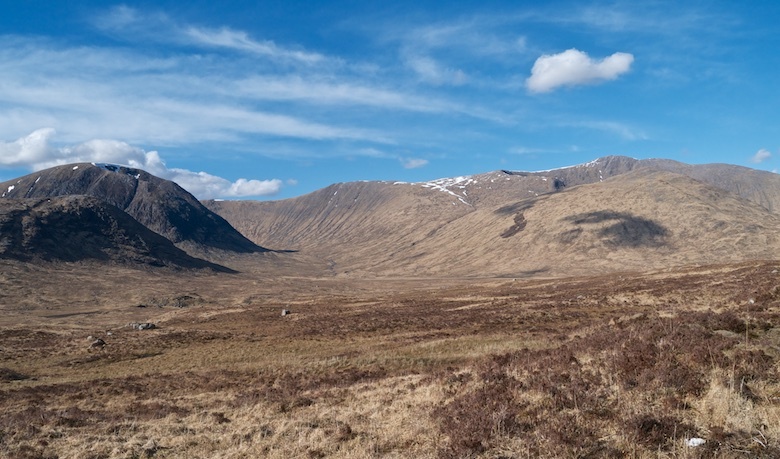 I decided not to join what was likely to be another Challenger and continued down the glen. Finally a flat and well drained spot was found close to where the Allt Ghabhar bridge used to be. With the early evening sun and a gentle breeze it was a delightful pitch. I was glad to get my shoes off and tend to my feet that felt battered after another long day mostly on hard surfaces. They were looking forward to getting stuck into the wet bogs later in the trip. The first part of the night was spent with the door open, looking out to the hills to the west as I lay comfortable in my down bag. The rain came as forecast in the night, a thick drizzle that sounded worse than it was. 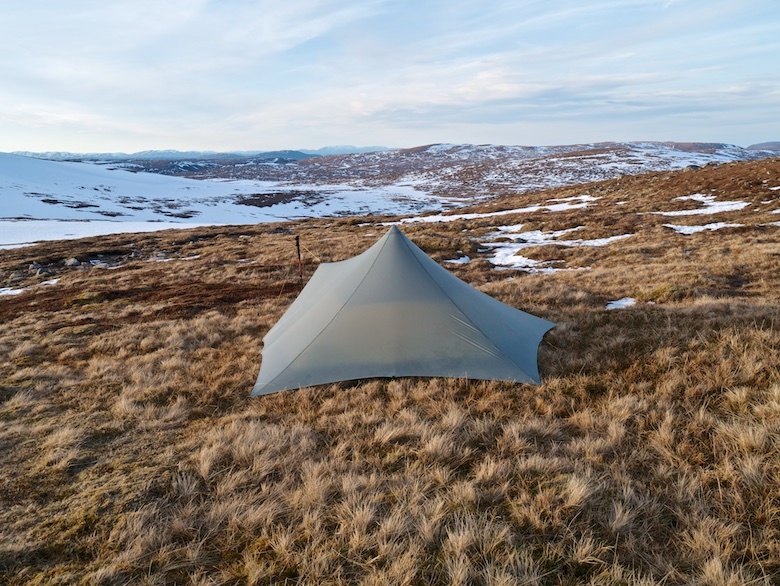 In the grey morning whilst still laying in my bag I heard a ‘Good morning’ being shouted from close by, possibly the occupant of a red Hilleberg that had been pitched next to the Allt Suil na Curra the night before. There is nothing worse than getting up in the rain to find the en-suite for the morning ablutions. I set off into the forest and bumped into the Challenger who had been occupying the SL3 the evening before. He confirmed that it had been an exposed spot (it was nice and still when he had pitched in the afternoon). Back at my tent I had a couple of coffees and breakfast before forcing myself to pack up and head out for a day in the rain. To start with the rain was soft as I made my way towards Victoria Bridge. I was due to phone in when I crossed the A82 but was unsure if there would be a good enough signal. Luckily I came across John and Sue who I had first met at Mar Lodge during the 2013 Challenge. 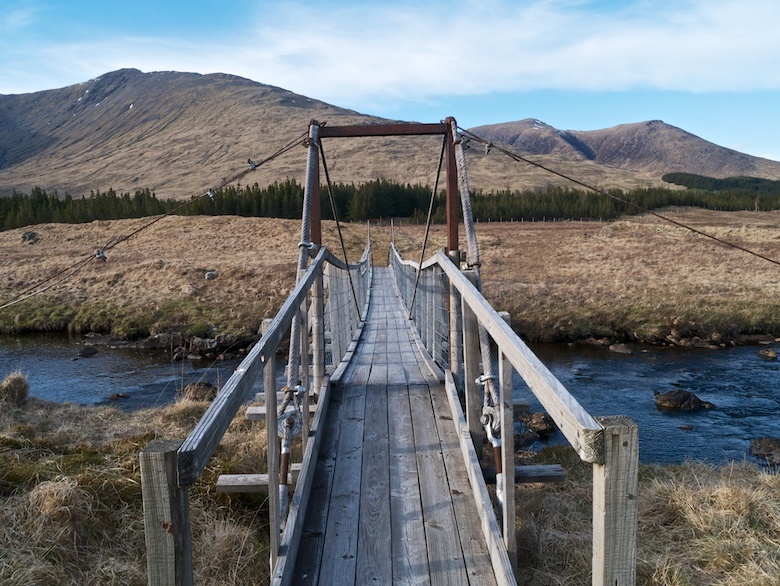 They were heading to the Bridge of Orchy Hotel to pick up a parcel. They kindly offered to let control know that all was ok when they phoned in there. The rain stopped for a while as I walked along the north shore of Loch Tulla, a wood at its eastern end giving shelter for lunch. 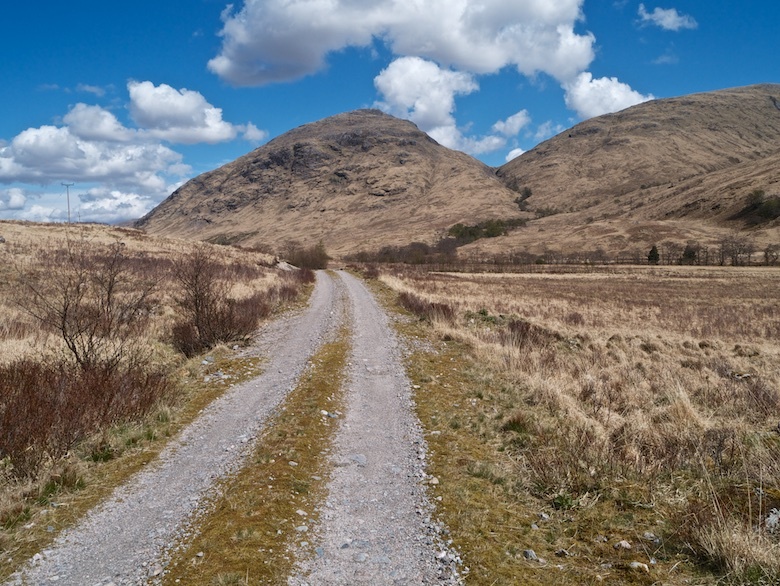 A kilometre walk south along the A82 was probably one of the most dangerous stretches of the whole two weeks. It’s a fast stretch of road and vehicles thundered past. The rain returned with a vengeance along the track to Gorton bothy. The wind picked up and my world shrank to a small window through my hood as water fell from the sky in great gusty sheets. The last hour to the bothy was endured rather than enjoyed. 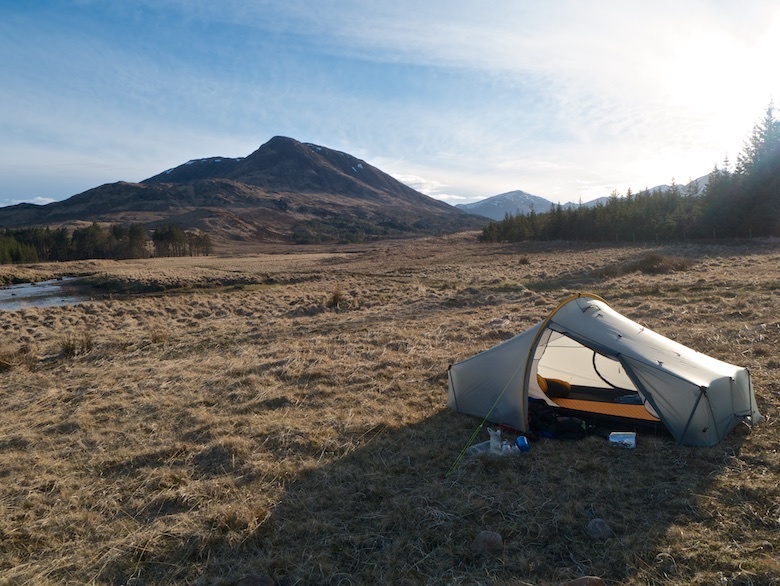 The occupant of the red Hilleberg from the night before was already at the bothy and we were soon joined by another Challenger who I had passed on the track. It was tempting to stay the night in the bothy as conditions outside were pretty horrendous. However I am a solitary creature, especially at night and it was clear that many others would be heading the same way. I therefore decided to go out and pitch close to the bothy. I got the Scarp up, fetched water and was quickly inside stripping off soaking clothing. I was soon dry and warm and decided that I would not venture out until morning. I watched another challenger pitch some ultralight contraption that simply flapped around in the wind. I was glad that I had the solid walls of the Scarp between myself and the weather. The rain hammered upon silnylon all night. My rucksack is packed and my shoes are by the front door. Tomorrow is the long train journey to Oban. I may do a bit of blogging on the trail from ‘Backpackingbongos blogging on the move’ you can find it here. 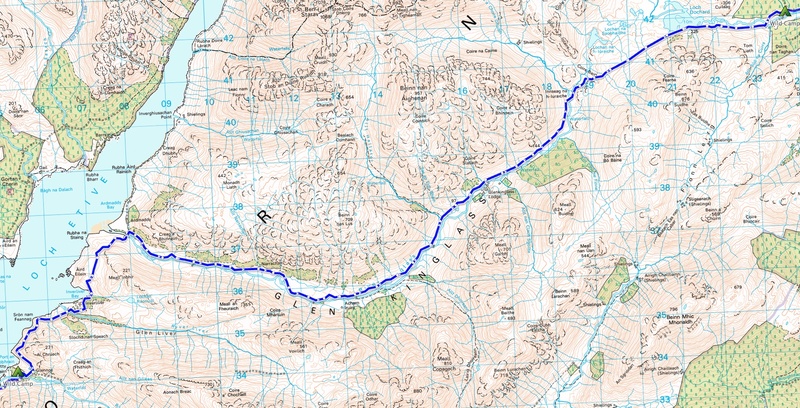 I have also created a Social Hiking map thingy where you can view other Challengers as they move their way across Scotland. Link to that here. 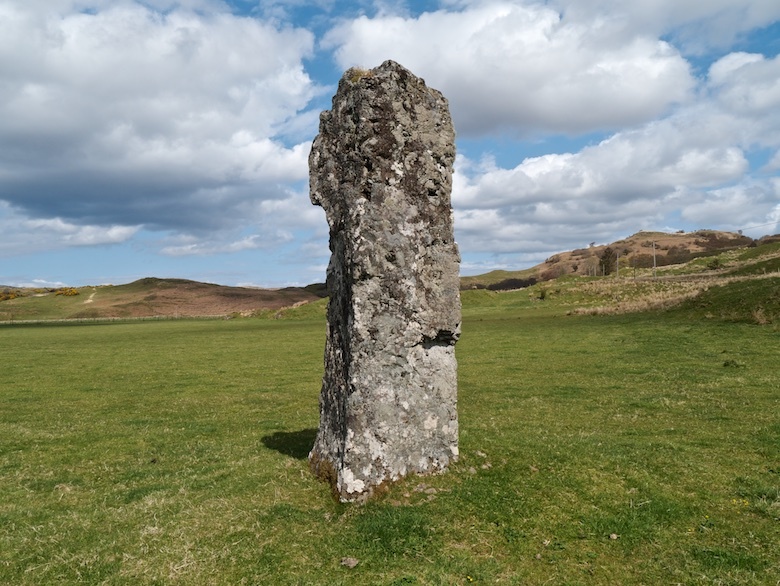 I thought that it would be good to briefly deviate from my ‘no gear’ blog policy for a bit and do a post on what will be accompanying me on this years Challenge. Still no spreadsheet though! 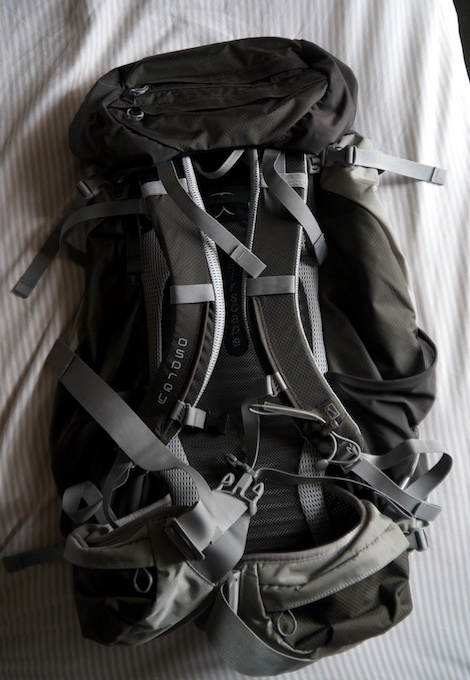 My pack will be the Aiguille Mountain Dru 50L + 10L. I have been using this since last Autumn and so far have been impressed by the way it carries. It’s a basic sack made out of old-fashioned bomb proof materials but still weighs in at less than 1.4kg. It has a floating lid which I like but no side pockets. I have therefore added a lightweight Granite Gear one to the side compression straps. Items needed during the day will fit in that and the lid pocket. A MLD Shoulder Strap Pocket on either side holds a 500ml water bottle and my Spot2 tracker device. I do like a good waterproof stuff sack so there are various sizes and models for clothes, food, sleeping bag, electronics etc. Probably overkill and extra weight but I know what goes where and whats in each one. Aiguille produce their packs in a workshop in Staveley with a retail unit on site. It’s good to buy from the UK for once rather than overpriced packs from the US which are then subject to customs charges. My sleeping bag is the PHD Hispar 500. Despite a recent wash it is past its best and the down no longer lofts as it should. It is fine as long as the temps don’t drop much lower than freezing. My pad is the Therm-a-Rest Prolite regular. 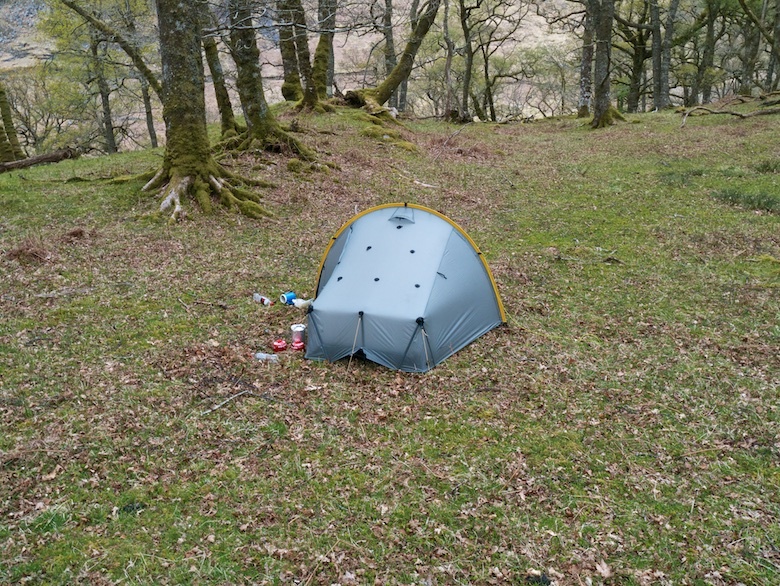 After using an Exped Downmat over the winter it felt a bit cold and uncomfortable when backpacking last weekend. It’s my only other mat though and don’t want to splash out on a new one. 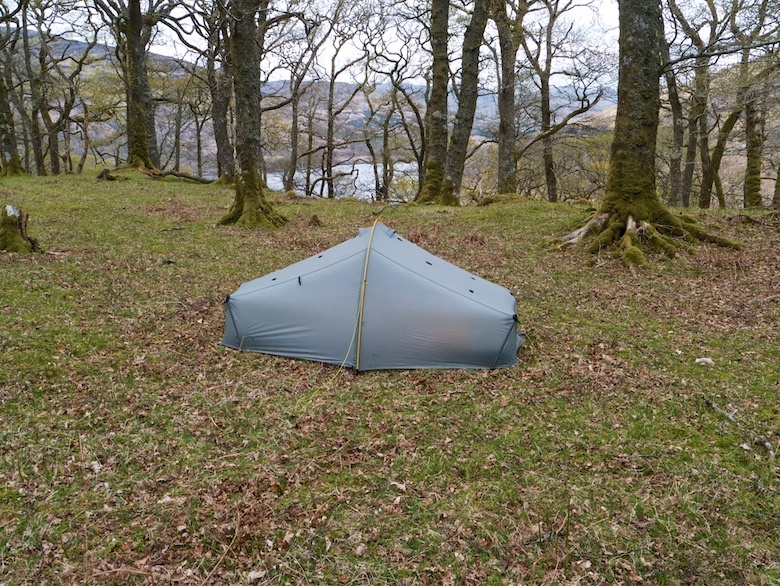 It’s my third Challenge and the third time I will be taking along the Tarptent Scarp1. It’s reasonably light, easy to put up and proven in wind and rain. I will not be taking the crossing poles this time though. It was warm and sunny on Friday so I spent time giving the seams a bit more TLC with some diluted Silnet. I have used a Jetboil Sol Aluminium for several years and really rate it. It is quick and easy to use and frugal with gas. I sometimes like to make a coffee and cooked lunch and this does so without much effort. To see me through the two weeks I’m going to take two 230g bottles of gas. The first opportunity that I will have to restock gas will be Braemar, one canister won’t last me that far. I have a homemade pot cozy to save on fuel. After spending a year in leather boots I have decided to go back to using trail shoes. This time I will be wearing Salomon Fellraiser. 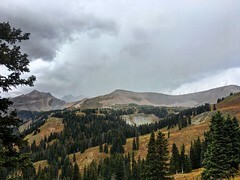 They did a 40 mile backpack last weekend and I had no issues with blisters or sore spots. 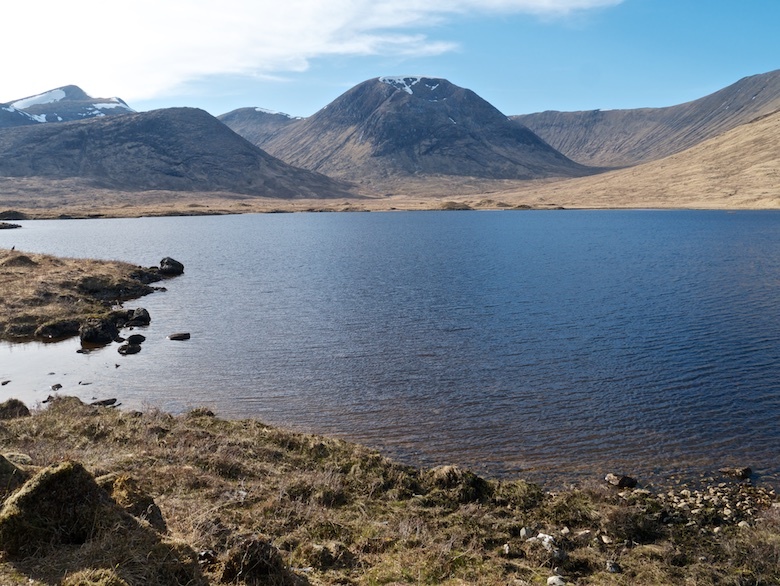 Who knows what they will be like on Scottish mountains and bogs for nearly 200 miles. Socks will be Xsocks Expedition Short, they fit me well, are warm and dry quickly. Trousers are Montane Terra pack Pants, a lighter version of the popular Terra pants. Shreddies are Finisterre Keel Boxer. The Merino keeps me fresher for a bit longer! Base layer is the Rab Meco 165. I have worn this on every backpack over the past year. Love it. If cool I like to wear a 100 weight fleece rather than an overpriced softshell, they are also good under a waterproof shell. I’m taking an ancient North Face one. Waterproof top is a Rab Myriad Jacket. I think its OK rather than brilliant. It is let down by not having an external storm flap. Water resistant zips are rubbish in my opinion. Very breathable though. Waterproof trousers are Rab Xiom Pants. Not the best I have ever used, legs feel damp in heavy rain as not brilliantly breathable. Not splashing out on anything new yet. 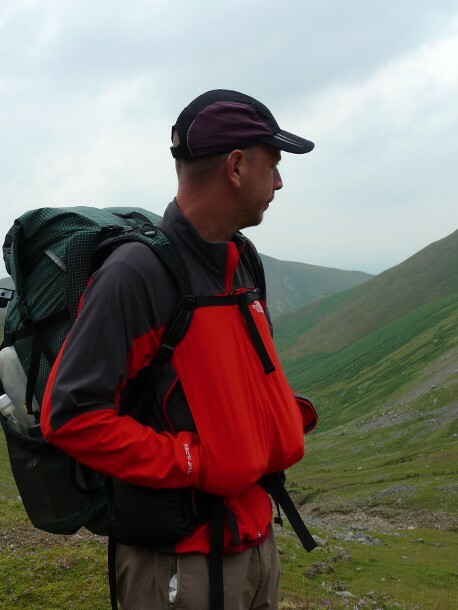 Another pair of Montane Terra pack Pants, I like to have something clean for civilisation. Another pair of Finisterre Keel Boxer. Two more pairs of Xsocks Expedition Short. A warm Arc’teryx fleecy base layer to sleep in (no idea of the model). Finisterre Zephyr Long Johns to sleep in. A Sherpa beanie for my head. Finally I am taking my PHD Yukon hooded down jacket to ensure that I am toasty in camp. My camera will be my trusty Lumix G3. I always backpack with a Kindle and a Powergen battery charger. Five 1:50k OS maps and two print outs will get me across the highlands. I’ll post the maps home as I go along. Poles are Black Diamond Trail Trekking. First aid kit is homemade. There are loads of other bits and pieces but I think I have included the main stuff. No idea what it all weighs yet, I will find out on Wednesday when I pack it. There is nothing that I want to leave behind so there is not much point in worrying about weight at this point. Still deciding whether to take spikes though.